Courtesy of the attorney general's report "Reducing the Supply of Illegal Opioids in Washington State"
The three largest distributors of opioids operating in Washington failed to report large, "suspicious" orders to law enforcement, illegally shipped those orders, and helped fuel opioid addiction across the state, a lawsuit recently filed by state Attorney General Bob Ferguson alleges. The 58-page complaint, which was filed on March 12 in King County Superior Court, claims that the defendants, McKesson Corp., Cardinal Health Inc. and AmerisourceBergen Drug Corp. violated state law by failing to identify large orders that might go to pill mills — doctors, clinics or pharmacies that prescribe excessive opioids without an actual medical justification — and, ultimately, the black market, nor did they notify the federal Drug Enforcement Agency and halt the shipment of said orders. "Their conduct, put quite simply, fueled the state's opioid epidemic by shipping staggering amounts of opioids into our state," Ferguson said at a March 12 press conference. "These three companies had a legal obligation to be a key line of defense against the free flow of opioids into our state. Instead, they were driven by greed." Between 2006 and 2014, the three companies supplied over two billion opioid pills to Washington, while in 2014, Pend Oreille County received enough opioids to supply every resident with dozens of pills, a press release from Ferguson's office asserts. Additionally, the three companies — who were all listed in the top 15 of the Fortune 500 based on their 2017 revenue — may have shipped over 250,000 "suspicious" orders into Washington between 2006 and 2014, according to estimates from the Attorney General's Office. The Healthcare Distribution Alliance (HDA), a national trade association representing drug distributors — including the three companies named in Ferguson's lawsuit — has pushed back against the filing: "The idea that distributors are responsible for the number of opioid prescriptions written defies common sense and lacks understanding of how the pharmaceutical supply chain actually works and is regulated," John Parker, senior vice president at HDA, says in a statement responding to the suit. "Those bringing lawsuits would be better served addressing the root causes, rather than trying to redirect blame through litigation." 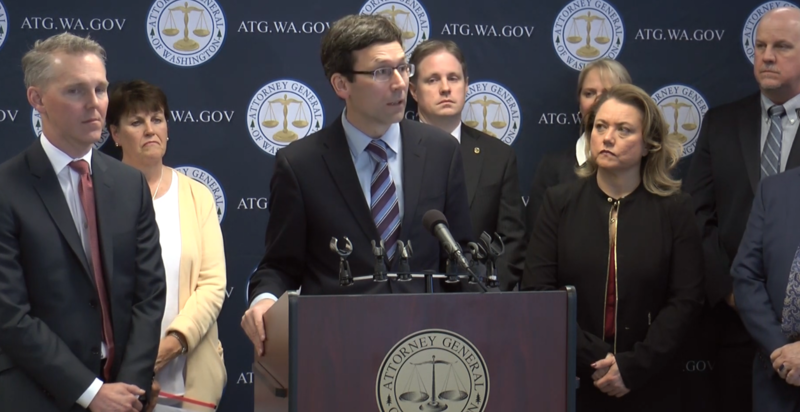 Attorney General Bob Ferguson speaking at a March 12 press conference. 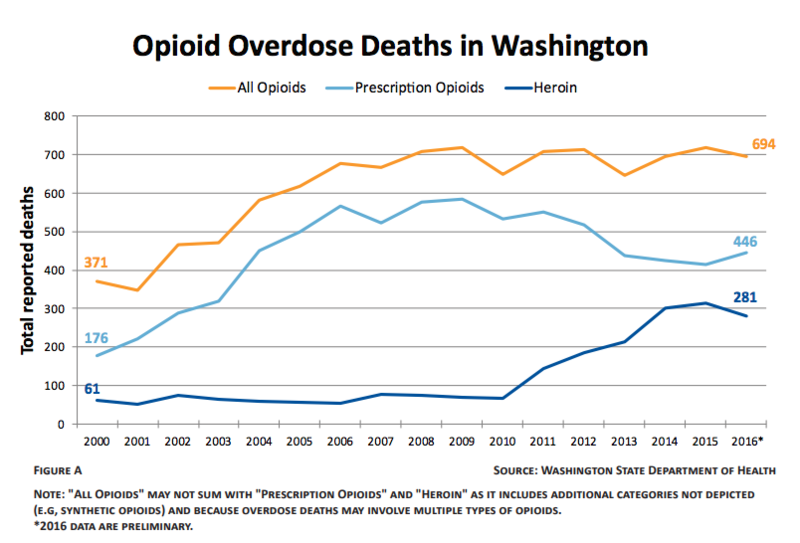 Similarly, numerous Washington counties with higher rates of opioid prescriptions experienced higher rates of overdose deaths, such as Pend Oreille, Lincoln, Lewis and Grays Harbor counties, per the report. In Spokane County, the rate of opioid prescriptions was between 74 and 82 per 1,000 people in 2014, while the opioid overdose death rate between 2011 and 2015 was roughly eight per 100,000 residents. The filing also notes that the cumulative rate of "opioid-related inpatient hospital and clinic stays" in the state spiked by about 60 percent 2009 and 2014, the "fourth greatest increase in the nation." "The sheer volume of pills flooding the market is a key contributor to that devastation," Ferguson said at the press conference. "It is time to hold these companies accountable for the harm that they have caused." The three companies targeted in the lawsuit also have a history of violating opioid shipment regulations. The DEA has fined McKesson over $160 million for failing to report “hundreds of suspicious orders placed by pharmacies participating in illicit internet schemes,'" while AmerisourceBergen had its distributor licenses revoked in 2007 on similar grounds, per the Attorney General's Office. This isn't the first time Ferguson has gone after the pharmaceutical industry due to the opioid crisis: In 2017, his office sued Purdue Pharma, the maker of Oxycontin, alleging that they engaged in a deceptive marketing campaign that downplayed the addictive properties of opioids. This post has been updated to include a statement from a Healthcare Distribution Alliance staffer.